Menrath Palace is located at the centre of Novi Sad (Krelja Aleksandra 14). It was built in art nouveau style in 1908 and is one of the most unique sights of the city. The palace – as well as the synagogue – was designed by the famous architect Leopold Baumhorn. The building was commissioned by the family of master carpenter Lorenz Menrath. Novi Sad was one of the first towns in which the Germans settled. The German population grew strongly in the second half of the 19th century due to new settlers from German hamlets in the region. Lorenz Menrath, like many Germans, came from Odžaci to Novi Sad. 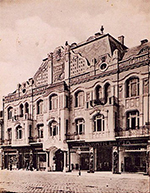 The 24-year-old master carpenter moved to Novi Sad in 1843 and founded his own business called “L. Menrath&Son”. Later on, he also dealt with furniture. The company seemed to have been a successful business and when their buildings were destroyed in a fire, Josef Menrath decided to commission an ambitious new building. The two-story building with its square layout was located in the noble surroundings of the town hall. It comprised two apartments, two courtyards and various rooms used for business. The Menrath family lived in the two apartments on the upper floor; the family’s furniture shop was located on the ground floor facing the main street. LEFT: The façade of Menrath Palace is decorated with rich art nouveau ornaments, early 20th century. 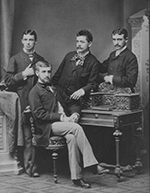 RIGHT: Lorenz Menrath’s sons: Lorenz, Ernst, Viktor and Josef in 1880.